Preface THE BLUEJACKETS' MANUAL was originally written in 1902 by Lieutenant (later Rear Admiral) Ridley McLean, USN, for the United States Naval Institute. It has served the Navy for nearly sixty years as a source of practical information for the enlisted man. Its various editions have traced the progress of the U. S. Navy from its first battleships to the latest super-aircraft carriers and guided missile ships firing atomic weapons; from the earliest submarine to the atomic-powered Nautilus and Sea Wolf; from primitive torpedo boats to the giant-sized frigate; from black powder to rockets and automatic weapons. 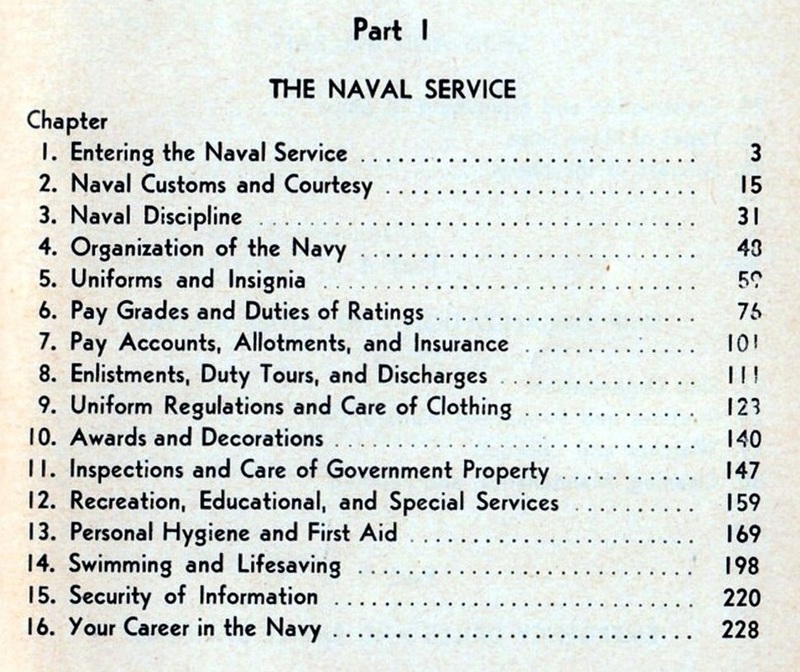 This manual mainly serves two types of Navyman. First is the recruit—new to the Navy, he has here a handbook of basic knowledge about his new profession. Backing-up his on-duty instruction, his off-duty study of the BLUEJACKETS' MANUAL will help make him a well-informed, confident, and productive bluejacket. Second is the long-service Navyman—the man who is advancing into the area where he must use his "military and general-Navy" knowledge more than ever before. Whether he be a PO3rd or CPO, he will find between the covers of this manual the most complete and up-to-date collection of such key information. No finer tribute can be paid to THE BLUEJACKETS' MANUAL, after more than half a century of use as an essential text in the Navy's education and training system, than the name which it has acquired from three generations of men who have used it—"The Bluejackets' Bible." When you open the PDF's, the pages will be small but you can magnify the pages for easier reading.